Aida Japan is launching a new modelling clay on the market these days. The new Art Clay Silver 950 clay is more stable and harder than the type Clay 650 and 800 series. This is achieved by a higher copper content in the mass. This consists of 90% silver / copper alloy and 10% binder and water. This makes Art Clay Silver 950 – nearly sterling silver metal clay. After the firing, a piece of this Art Clay jewellery will have a a silver content of 950/1000 – which is comparable to sterling (silver 925). The shrinkage is somewhat higher than for the fine silver modelling compounds and is approx. 11-13%. The new silver clay is processed and dried exactly like the other silver masses of this manufacturer. However, burning is possible only in a kiln and requires two steps (heating ramps). After the firing the new Art Clay Silver 950 has a higher surface and bending strength compared to the other Art Clay Silver clay varieties. Due to its high strength, it allows for more design possibilities and better durability, especially for jewelery which is thinner or narrower, has an open ending (ring and cuff), etc. The finished silver jewellery piece is more resistant to scratches, which should make it particularly interesting for professional artists who sell their works. Art Clay Silver 950 is only available as modelling clay. However, you can make their own clay paste from it. Or fill it in a syringe and use it as syringe type. 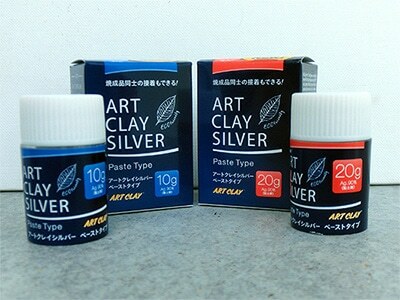 Introductory offer: Art Clay 950 silver in pack sizes of 25g and 50g with 10% bonus! Order now at the Akisashop! Please note: certain people may be allergic to jewellery from Art Clay Silver 950 (unlike Art Clay Silver 650 and 800ST)!